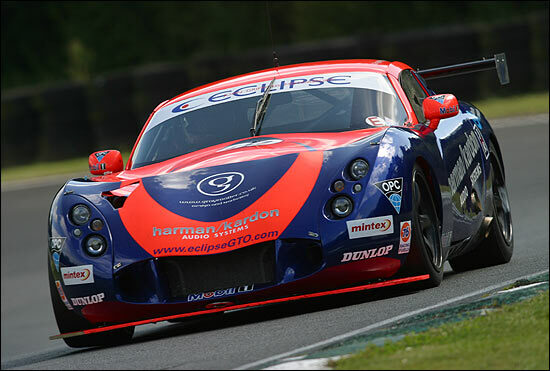 This is developing into an extraordinary season for the Eclipse Motorsport TVR Tuscan T400R – and Piers Johnson and Shane Lynch. Six meetings (and seven races) into the season and they’ve got a string of results that go a long way to balance out all the misfortunes of 2002. Remember at the start of the season when you could almost write the race result before the lights had gone green (Mosler-Mosler-Eclipse)? There were four of those, including both results at Knockhill. 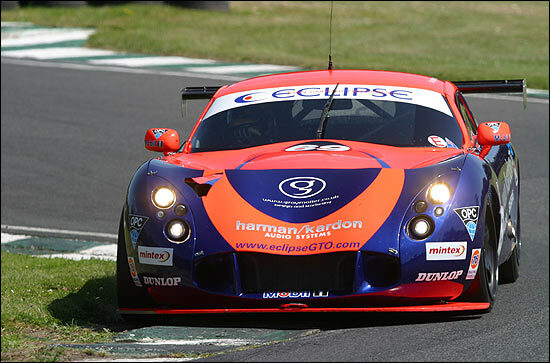 The win at Silverstone changed the sequence, then came the only car failure at Castle Combe last time out – a rose joint failed two laps from the end, but Piers and Shane were still classified, seventh in class, and a very useful 12 points. 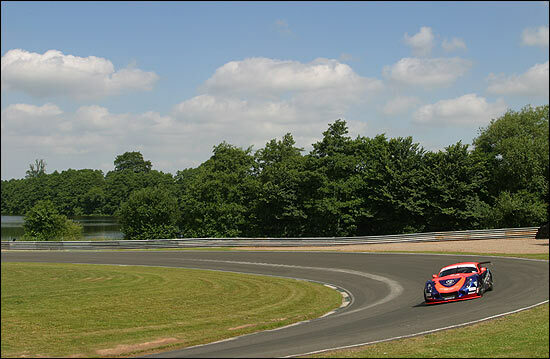 And so to Oulton Park – a meeting marked by a heat wave across Britain, and also a superb win (number two) for the quickest, most reliable Tuscan in the Championship. A 1:41.1 in testing on Friday, second quickest to the Balfe Mosler, suggested that this meeting could be between these two, and that’s more or less how it developed. That was as quick as the Eclipse car would go all weekend – as the temperatures climbed on Saturday and Sunday. The Saturday morning session saw the Tuscan R fourth fastest, but the afternoon half hour was the more important one: “Piers will drive the whole session,” explained Shane. By mid afternoon, it was very hot indeed – and grip was at a premium. Understeer was the theme for #69. “We had more understeer than this morning, so I came in for an adjustment, and we went the wrong way – but at least we know which way to go now!” explained Piers. We concluded that remark in dsc’s race coverage with the comment that Piers was very confident for the race. He was half a second slower than the Balfe Mosler despite the understeer, and was only slightly concerned that perhaps he was the only one finding the track slippery: in fact everyone was, thanks to the heat - and some oil down too. Fresh rubber didn’t actually help anyone go quicker than they had on Friday. So Shane to start, and the last thing he wanted was a challenge from the Ultima on the second row: he wanted a straight fight with the Mosler on pole. The Rollcentre Mosler was in set-up difficulties and effectively wouldn’t be a threat on this day. 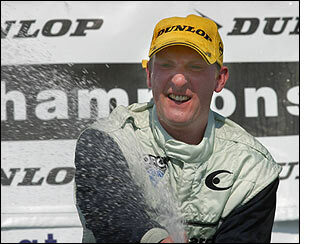 From the rolling start, Shane made a good start, but Steven Brady made a slightly better one in the Ultima. “Shane – ever the gentleman – would later say what a pleasure it was to see the Ultima going so well, but he can’t have thought that as he got stuck behind it for the first few laps – as the Shaun Balfe-driven Mosler hurried away in the lead. It was very close into Old Hall for the first time though, the paler blue car just about inching ahead at the apex and exiting the corner, as Shane ran out of room on the outside. This was hard but close racing. The Ultima was quick in a straight line, and its tyres seemed to come in sooner than those on the TVR. “But his tyres seemed to go off as mine came in,” said Shane later. The Irishman piled on the pressure (below), but Steven Brady resisted hard, for 11 laps. By then, the red and white Mosler was 15 seconds up the road, and logically hopes of catching it had vanished…. But Shane was through into second coming past the pits – perhaps Brady had had enough of the pressure from behind – and Shane had a clear track to go Mosler chasing. The gap more or less stabilised then, at about 17 seconds, but the Eclipse car was about to pit. The Ultima followed Shane in – but didn’t exactly follow Piers out. A much quicker Eclipse stop saw the gap out to 16 seconds by the time these two completed their first laps, and it grew from there. The Ultima was no longer a threat. Piers had also maintained second place, Shane having pulled well clear of any other cars that might have been pitting later. The leading Mosler stayed out much longer, and Piers got his head down to try and manage the 48 second gap between them. Much would depend on a quick Mosler pit stop – and after 19 laps, that’s exactly what happened. The gap had been growing a little, about half a second per lap, so realistically it looked like second place would be the outcome. 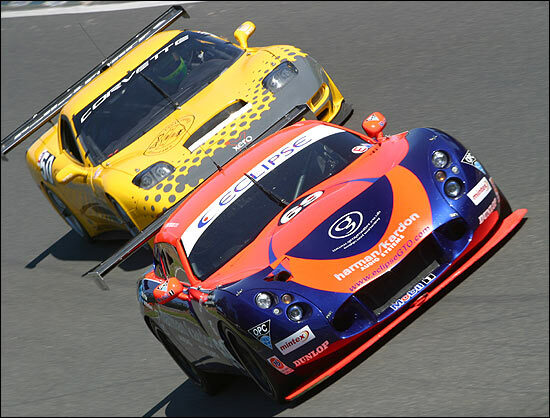 With the Mosler back on track with Jamie Derbyshire at the wheel, it was a 20 second deficit. Piers piled on the pressure, lapping in very low 1:43s – and suddenly the Derbyshire car was in the 1:45s. The gap came down at two seconds or more per lap, and with 25 minutes of the race to go, this was suddenly looking like a very different race. Derbyshire was in trouble “finding gears on the downshift.” He couldn’t enter corners as quickly as he would have liked, and Piers closed in. With the Ultima in trouble with a loose wheel, and the Rollcentre Molser a fairly distant third, it would be between these two. Piers looked a definite favourite to take the lead 15 minutes or so before the end of this 60 minute race, but it happened rather sooner than that. The Mosler came trickling out of Deer Leap with a broken throttle cable, and Piers charged past and into the lead – one he wasn’t about to lose. With ten laps to go, the Eclipse Tuscan T400R didn’t ease up a fraction – at least not until the last couple of laps. 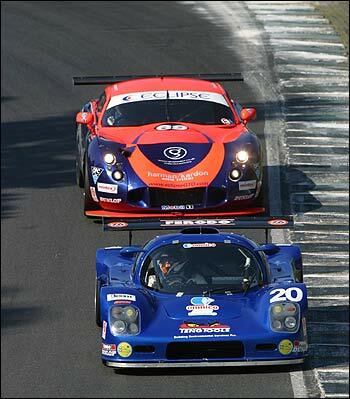 At the flag it was a 33 second margin over the Rollcentre Mosler. The biggest grin was probably from Shane Lynch, who is certainly taking advantage of the better fortunes the team are experiencing this year. Championship leader Tom Herridge remains out front, but his nearest challengers are now Piers Johnson and Shane Lynch. With four races left, it couldn’t be much closer. 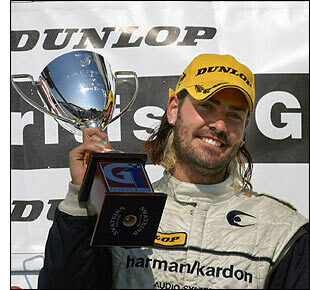 The Balfe Mosler pair may have the fastest car, but Eclipse has the record (shared with Herridge) of scoring in every round. Rockingham next, then Thruxton, Spa and Brands Hatch. It should be a thrilling end to the season. 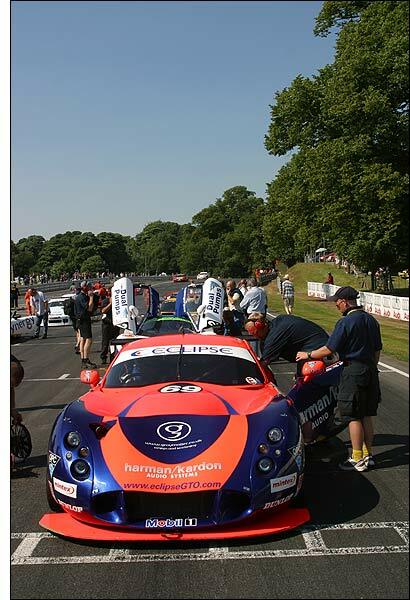 Simon Pullan will join our intrepid pair for Spa and the 1000 kms at the end of August. Shaun Balfe / Jamie Derbyshire 113.